Swansea City head coach Francesco Guidolin says one more win will secure the club's Premier League status for another season. Guidolin's side came from two goals down to secure a point at Stoke City and are 10 points clear of the relegation zone. The Swans have six games remaining and Italian Guidolin does not believe his team are not yet safe from relegation. "No. 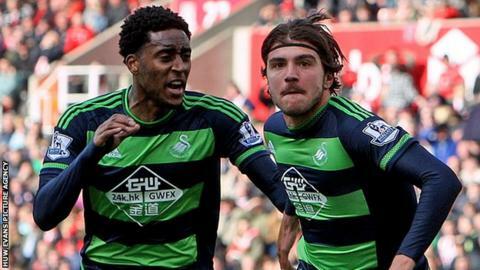 I think we need three points," Guidolin said. "The season is not finished, for us or any of the teams. "It is important to play in the future, like next week for example, with this character and courage." Swansea, who have lost one of their last five games, remain in 15th position, still 10 points clear of 18th-placed Sunderland, who drew 0-0 with West Brom and have seven games to go. The Welsh side host Chelsea at the Liberty Stadium next Saturday having edged closer to safety with a 2-2 draw at the Britannia Stadium. Ibrahim Afellay and Bojan Krkic had put Stoke in control but goals from Gylfi Sigurdsson and substitute Alberto Paloschi saw Swansea rescue a point. "Stoke were the best team in the first half, but overall I think we had more situations to go forward than they did at the conclusion," Guidolin added. "It was a good transformation in the second half, but I saw my team play well in the first half as well. "I'm happy because I saw my team play to win and attack. "My team played with personality, and I am happy."